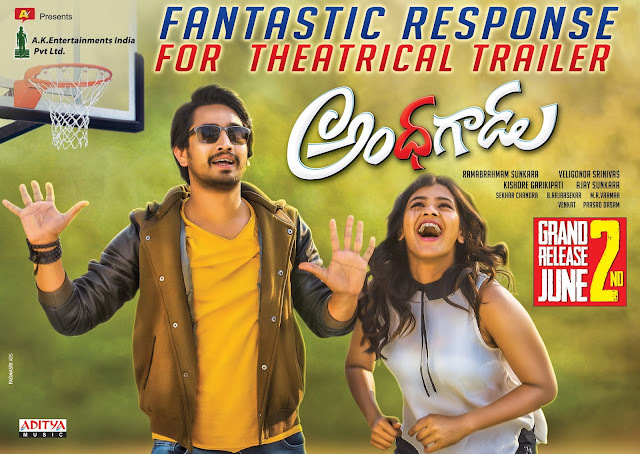 The theatrical trailer of 'Andhhagadu' has been released and it has taken the internet by storm.The hilarious trailer, which also suggests that the film has good action,thrill and romance, has got a fantastic response from the audiences. The trailer has been trending on Youtube and even the trailer on facebook has been shared widely. The digital views for the trailer have already crossed 1 million views in 1 day. Looks like Raj Tarun and Hebah Patel are going to score one more big hit together. This is also AK Entertainments banner's third film with Raj Tarun and they are sure of a big success. Satya and Sudarshan as Raj Tarun's sidekicks are going to entertain the audiences. Sekhar Chandra's songs have also been received very well and the team has been planning a grand pre-release event soon. The film is going to have a big release on 2nd June. Writer Veligonda Srinivas is making his debut as director with this movie and he has come up with a superb script, packed with surprises. The film has Ashish Vidyarthi, Raja Ravindra, Rajendra Prasad and others in important roles.